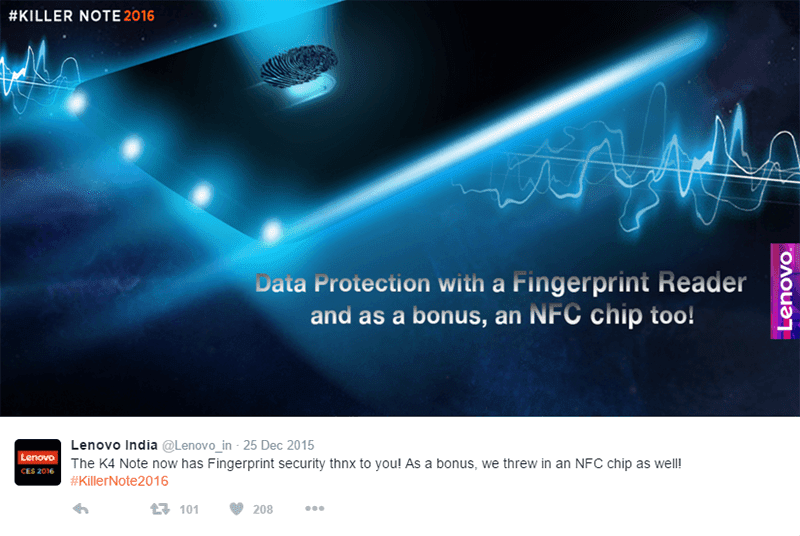 Remember the Lenovo Vibe K4 Note teaser by Lenovo India? They added more information about this upcoming "Killer Note 2016" phone. Lenovo India tweeted this "When is a display more than just a sum of its pixels? Get ready to thrill your senses with the Vibe K4 Note" which could suggest that we might see something super good with the display of this upcoming phone. They also said that this phone will now boast 3 GB of RAM, NFC and fingerprint sensor at the back. Then according to the scoop by several Chinese websites this phone will boast a 5.5 inch FHD panel, MediaTek Helio X10 or P10 SoC, 32 GB storage, 13 MP rear camera and 5 MP selfie camera. Those sites also stated that it could come in 2 versions an 899 Yuan and 999 Yuan variant. If those claims about the price and specs of this phone, then this upcoming Lenovo K4 Note truly appears to be a "Killer Note" on a budget. Will this be the Lenovo A8000 Plus for the Philippine market?